You can find both detailed descriptions for our apartments and also the current prices here. The prices listed are for 2 people per day. In some of the two-room-apartments the bedroom has been restyled in spring 2014. This apartment is suitable for 2 to 4 people. 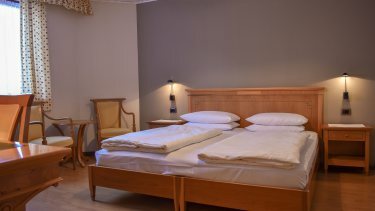 The two rooms apartment consists of a living room with kitchenette, a double sofa bed, a double bedroom and a bathroom. The apartments have either one floor or two floors connected by a spiral staircase. Some of the apartments have a restyled bedroom (restyled in spring 2014). Only in winter 2018-19: children under 3 years stay for free with us! New from winter 2019-20: For bookings from 7 nights on you get the reduced daily rates. Pets: The surcharge for pets (on request) is EUR 15.00 a day without food. Since the 01/01/2019, we are charging EUR 1.90 per day per person (from 14 years upwards) at the Post Residence as a municipal tax (visitor's tax).